I was a little slow in decking the halls this year but managed to get it all done before the kids got home from school. I changed a few things up this year and I love how they turned out. 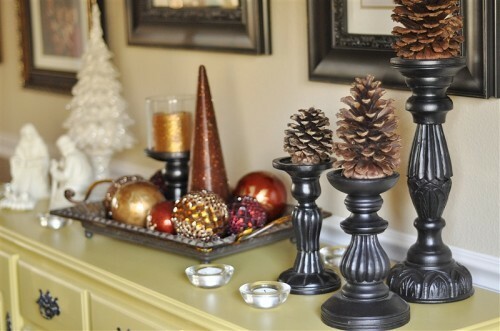 Today you get a little tour of some of my favorite holiday decor items. 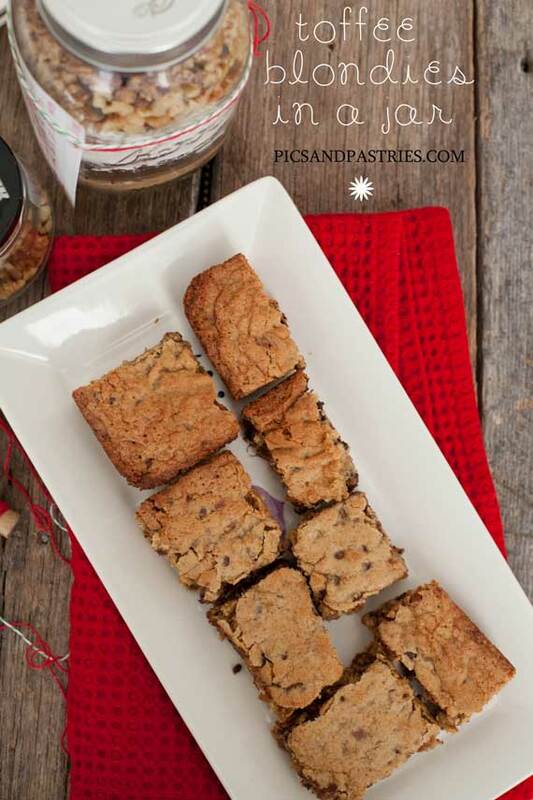 My number one, most favorite, holiday decor item this year is the large canvas I had made through Easy Canvas Prints. I am totally in love with it. I used one of the photos my fabulous photographer friend Tara took of our family and turned it into my holiday decor. The first thing my husband asked was, “Why did you cut off our heads?” He just didn’t get it. 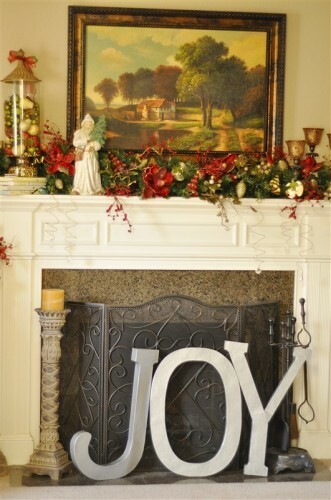 I love the way Joy is the focus of the picture and I can use it ever year as part of my decor. If you have a photograph you think would make a perfect canvas PhotoWhoa, a website that is like Groupon for Photography items, has a great deal right now. For only $39.00 you can purchase a $100.00 photo credit with Easy Canvas Prints. My cute little green trees came from Winco. 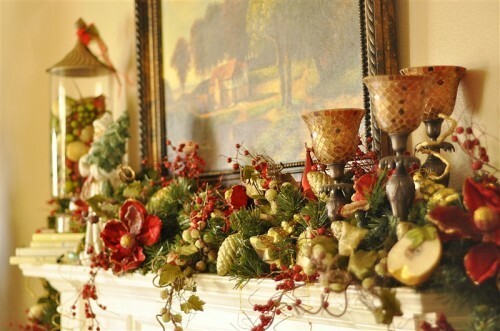 I am also loving the mantel in my living room. It is a little more formal. I decided to spray paint the Joy letters we used in our family photo. I used the Rustoleum Hammered Silver paint because I wanted them to look like metal. Not quite sure exactly what I am going to do with them but for right now they look fine in front of the fire place screen. 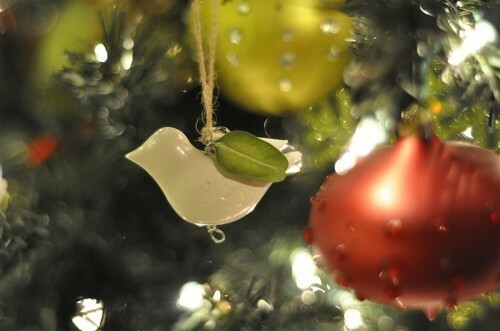 I’m loving my little Christmas tree ornaments too that I have on my living room tree. 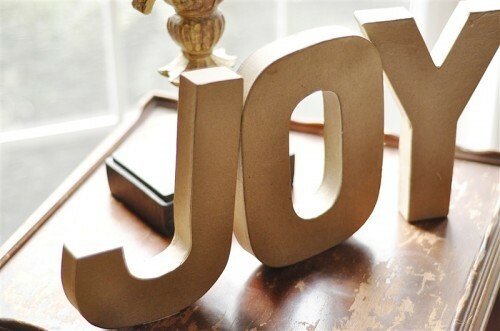 I can’t quite seem to get enough of Joy so I lined up a smaller set of Joy letters I have on a little end table I found at Goodwill that is waiting to be refinished. Just can’t quite decide what color to paint it. I was quite sure what I was going to do with my newly painted sideboard in the dining room. 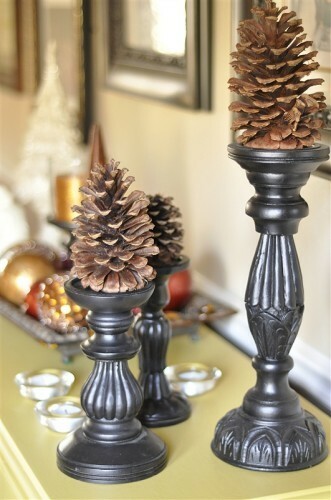 I bought a bag of pine cones at the store and love the way they look on my black candlesticks that came from Goodwill and were spray painted. 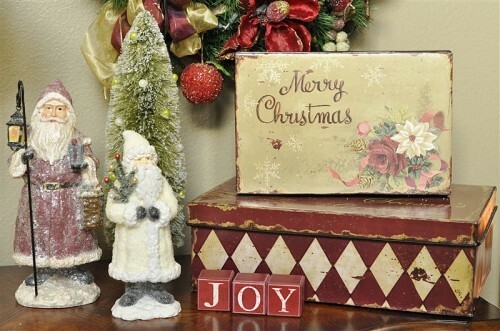 Out in the living room I used some vintage looking Santas along with a bottlebrush tree. During the holidays we move a this pine dresser into the entry way to make room for the tree and I always love to fill it with pretty candle holders and candles. The light looks magical at night against the mirror. 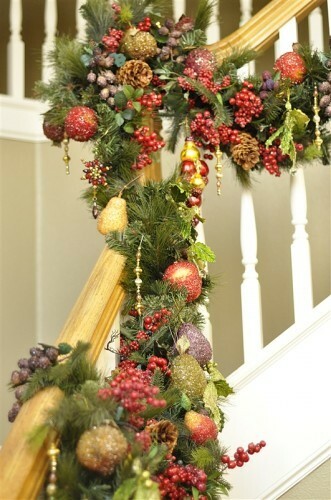 My very least favorite thing to decorate during the holidays is my banister. I hate the process but love the results! I always leave it to the last. My Joy tree is in the family room and it is filled with all kinds of fun Joy ornaments I have collected and been given over the last few years. One of the newest additions is this sweet little bird my friend Meg made for me. Look close, the word Joy is stamped on his side. Here is another of my favorite Joy ornaments. 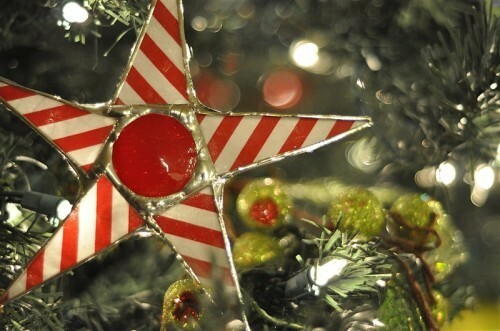 I also added a few of these amazing stain glass stars this year from Kurt Knudsen who has an etsy shop. I’m kind of in love and can’t wait to add more next year! 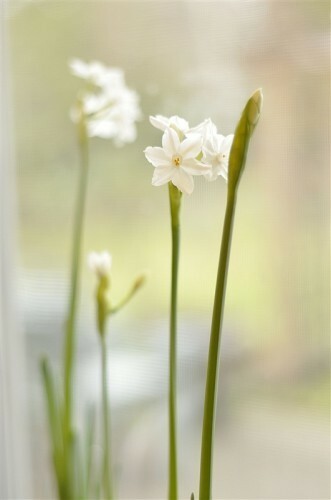 One of my favorite holiday smells is that of paperwhites. Mine are just starting to bloom. 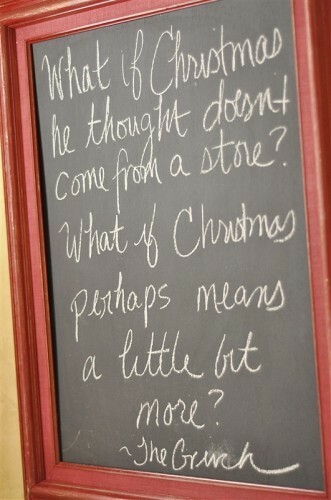 And I had to add a holiday thought to the chalkboard in the guest bathroom. The Grinch finally figured it out! That concludes our little holiday tour. Hope you enjoyed it! 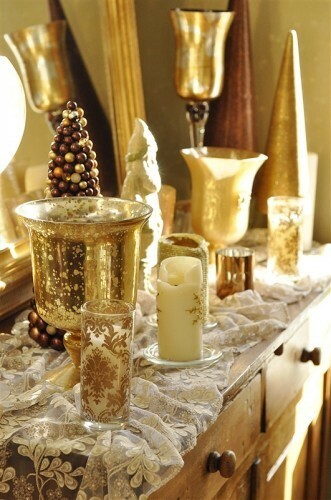 What’s your favorite holiday decor at your house? What a beautiful home you have. 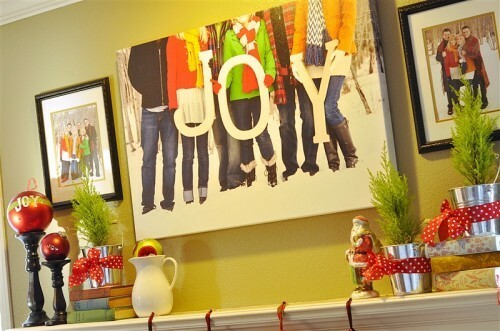 I love the JOY family photo as a decoration. What great memories it will bring back over the years. I loved your Christmas house tour. Thank you for sharing!! Thanks for showing us your beautiful home. 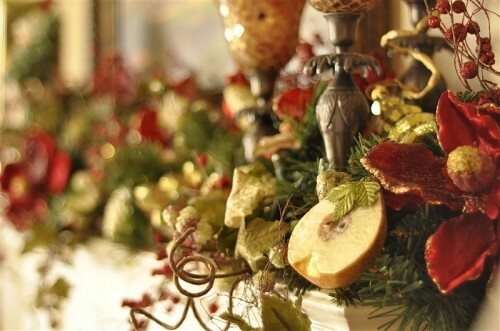 My favorite is definitely the living room mantle – very Della Robia with all the fruit and gold. Lovely and sophisticated. Wow, Leigh Anne: You absolutely have outdone yourself, but I can’t imagine how you can do that when you always outdo yourself. Your home is gorgeous and your ideas are spectacular. I can’t even imagine how you do so much in only 24 hours each day. But I love it all and I love that you share. Your family and your home are totally awesome. Merry Christmas and Happy New Year, LYMI (Love Ya, Mean It), Sue T.
PS – I am still waiting for your book of all of these wonderful ideas….. Thanks for sharing. I love your JOY them and your eye for details. I love the vintage santas and just the way you group things together. Absolutely beautiful!!! 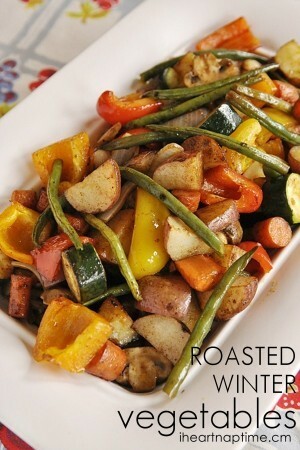 So proud that one of the very best home blogs is from right here in Oregon!! 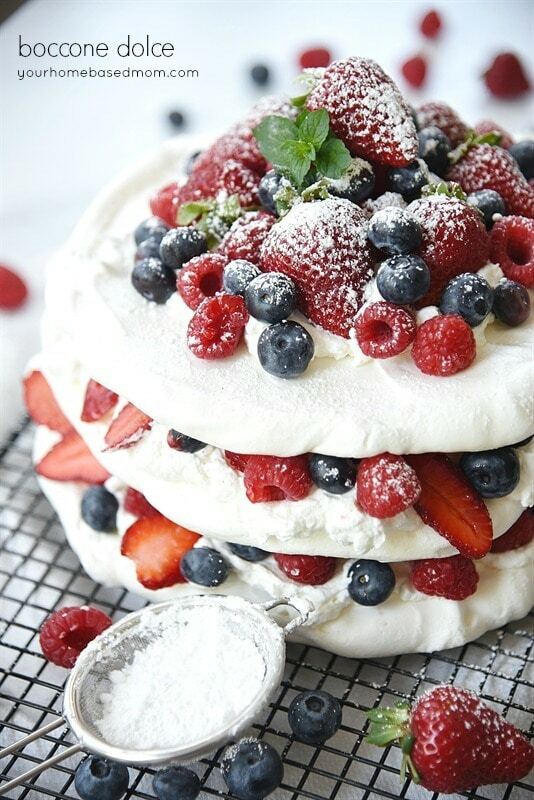 I love your ideas (and recipes! )…very inspiring to us all!! 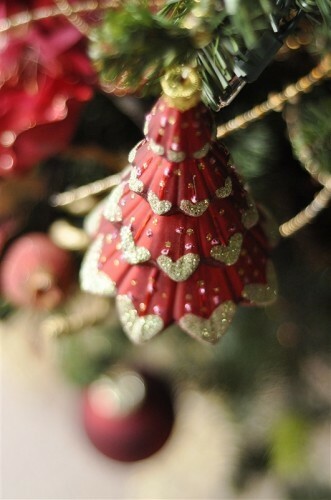 By the way, those little red Christmas tree ornaments are adorable….are they a recent purchase? If so, would you mind sharing where they came from? Merry Christmas to you and your family!! Thanks Mary and everyone for your sweet comments. 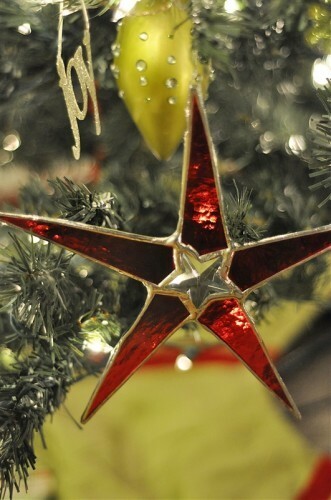 The Christmas tree ornaments are quite a few years old and I still love t hem! Beautiful home Christmas tour as usual! I love your JOY theme this year. I think everyone needs to be reminded to celebrate and take the time to enJOY life and our loved ones. Here is a little tour of my home during Christmas. Have a Joyful Christmas and Happy New Year! Love your home tour. Thanks for sharing. Have fun with your kiddos – it never lasts long enough when they come home. Merry Christmas. Love your focus on JOY! Your home tour was FABULOUS! Wish we could join you for all the Christmas cheer. Hugs from WA. beautiful! i love the giant silver joy letters!! wish i had more room to make seperate little vignettes like you have! i have started collecting naticity ornaments and i love them!! Your decorations are fun and beautiful too. I love your joy’s too. 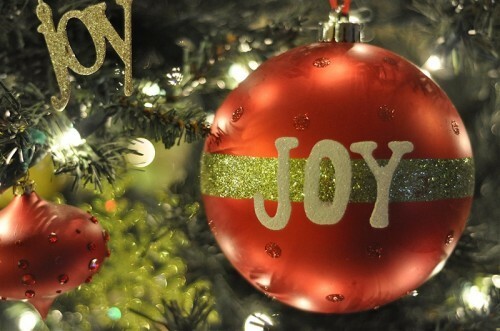 Did you ever think that JOY could mean “Jesus,Others, then You”? That’s what the JOY in my home stands for. I love that too – once I gave a talk to the young women at church and used that exact same thing – JOY – Jesus Others You! I LOVE the large wooden letters you used in these pictures! 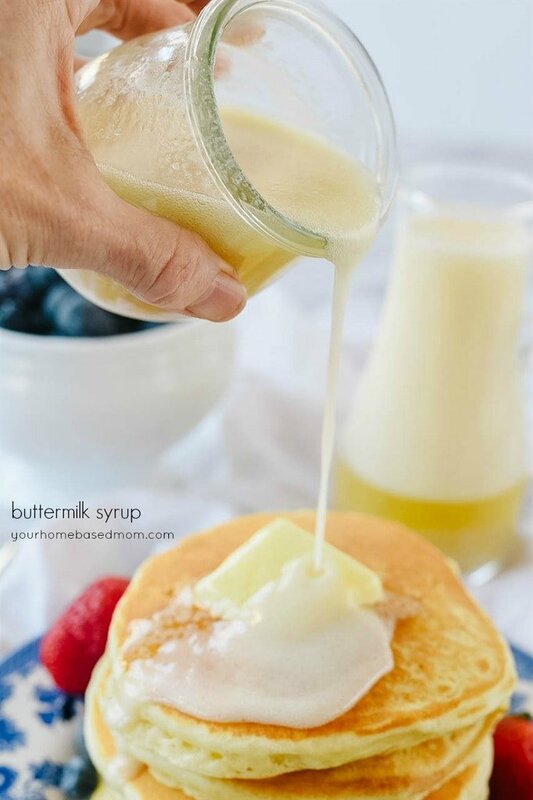 (saw this link on pinterest!) Where did you get them?? Would love to do a similar idea for our pictures this year. thank you! The letters aren’t actually wood but are made from brown craft paper and cardboard. I purchased them at Joanne Fabrics. Glad you liked it.